One of the most important meanings within the Page of Cups is that you should be open to new ideas, especially ones that stem from intuitive inspiration. The card seems to state that such inspiration should be embraced, despite it being something that you may not expect. It could lead you to adventure and open many doors. If it is a calling of a creative nature, for example, one to get into music or art, there's an especially strong push from this card to go for it. When you are being faced by difficult situations, and you have stopped chasing your dreams, the Page of Cups seems to say that you that you should tackle the issue from a totally different perspective. It symbolizes persistence as this is the only way that you can make your dreams come true. Listen to your intuition, follow your calling, and believe everything is possible. It symbolizes persistence as this is the only way that you can make your dreams come true. For those that are afraid to reveal their emotions, the Page of Cups could mean that it is time to release and show those emotions. The creative you and the emotional you should both be expressed, no matter how insignificant they may seem. In most cases, some people cannot express themselves as they want to protect their ego. 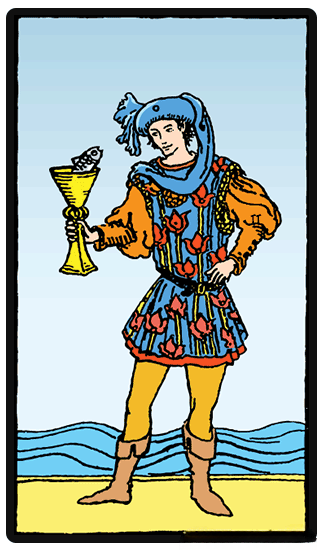 The Page of Cups indicates that it is alright to have a new beginning - to welcome the real you. One Page of Cups reversal meaning is that you are undergoing a block in your creativity. There are things or projects that you find interesting, but you seem to do them for other reasons than for the joy of it. You may be doing them for money, for fame, or something else. A reversed Page of Cups could indicate that you should remember the joy that your projects brought you in the first place to reclaim your imaginative spirit. Another Page of Cups reversal meaning is that it can symbolize a troubled person. One who is afraid of reality whether it s emotional, financial, illness or something else. They find these issues difficult to face, perhaps leading to abuse of alcohol or drugs to escape. It could be an image of you or a loved one who is struggling with self-acceptance. The Page of Cups could indicate that someone lacks inspiration, they are battling low self-worth, and they are easily depressed. What can you do to help inspire them to be their best self?